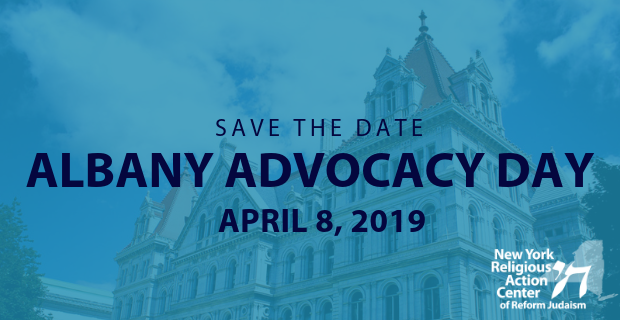 Mark your calendars: after several months of building community and deepening our network of Reform congregations throughout the state, the New York Religious Action Center of Reform Judaism (RAC-NY) is headed to Albany! Building on the longtime advocacy efforts of what was the Reform Jewish Voice of New York State and the congregational justice work of many of our key congregations, we’ll be meeting, training and lobbying together on our priority campaign, Driver’s Licenses for all New Yorkers. This legislative session, RAC-NY is focusing on this critical immigrant justice issue – one that speaks to our deeply-held Jewish value that we should care for the ger, the immigrant in our midst, having ourselves been strangers in this land and the land of Egypt. A project of the Religious Action Center of Reform Judaism, RAC-NY is a locally-led network of Reform Jewish communities working together to build a more just and merciful New York State. Contact Russ Agdern, Senior Organizer, to learn more and get involved. You can support this critical organizing work in New York State online or by contacting Laura Solomon, URJ Senior Major Gifts Officer.